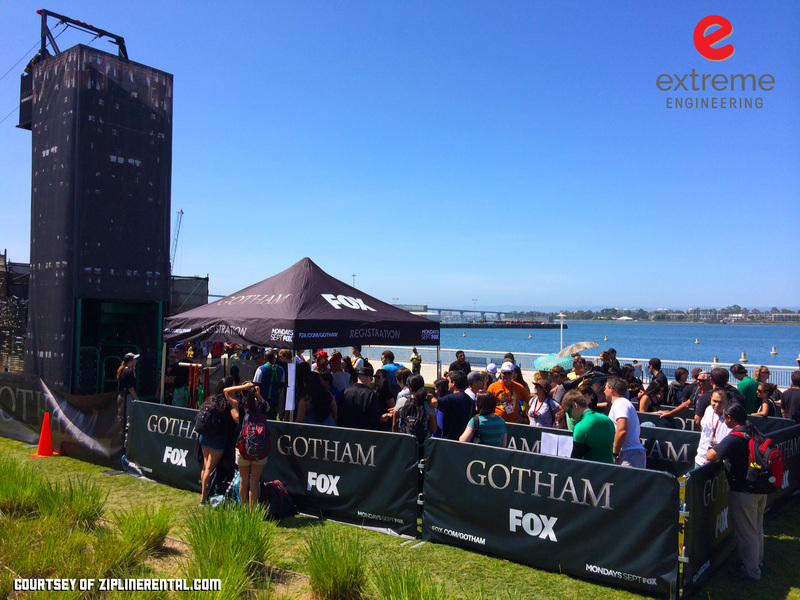 Extreme Engineering’s portable zipline marveled by the San Diego Mayor and the cast of the new FOX television show, Gotham™. 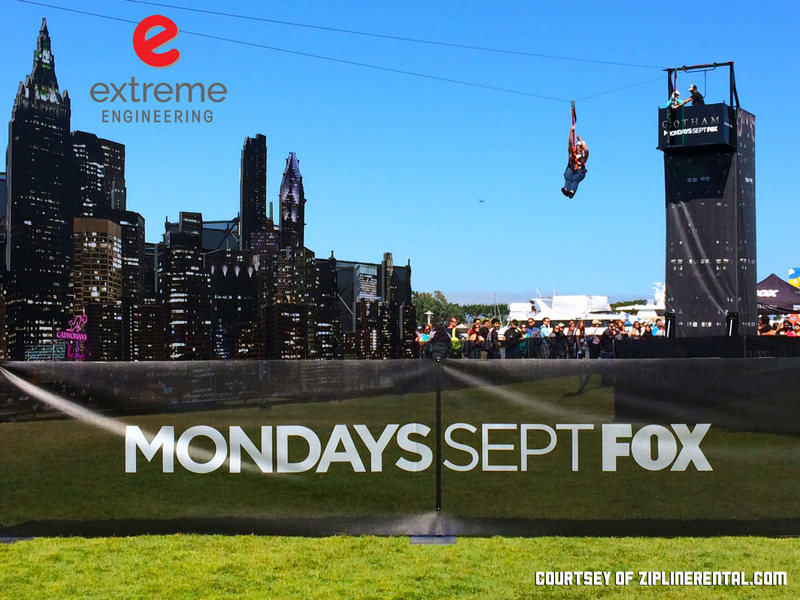 Sacramento, CA (July 29th, 2014) – It’s a bird, it’s a plane, nope it’s Extreme Engineering’s mobile zipline at this year’s Comic Con in San Diego, California. Comic book and super hero fans across the globe enjoyed ziplining across Gotham City™, taking the leap of faith off of a sky scraper. Extreme Engineering’s Fly Wire™ Zipline, winner of best Major Theme Park Ride at IAAPA (International Association of Amusement Parks and Attractions), was themed to be part of Batman’s® hometown, Gotham City™, allowing the Mayor of San Diego and the complete cast of the FOX television show, Gotham™, soar across a spectacular diorama. Thousands wait in line to ride the Fly Wire zipline at Comic Con. Comic-Con hosted over 130,000 attendees. From Batman®, Halo’s® Master Chief, to the Joker®, super hero goers transformed into their favorite comic book or fantasy character. 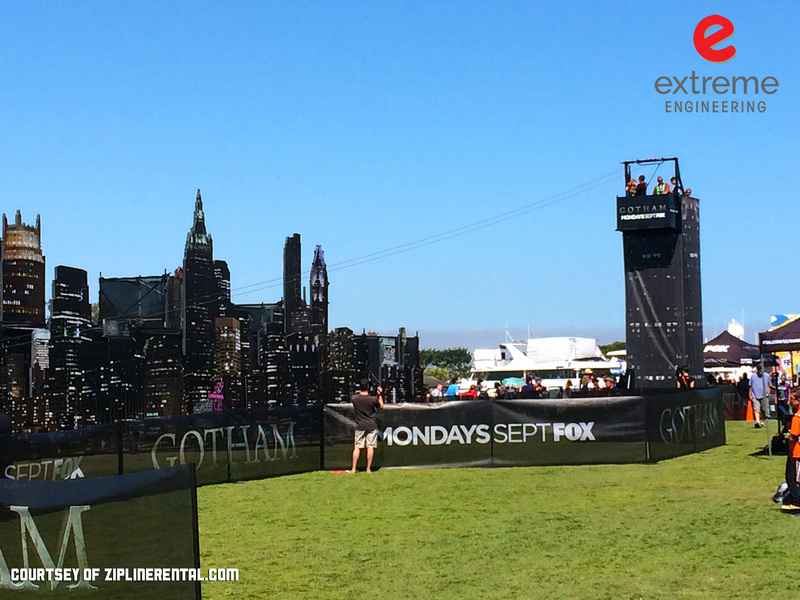 One of the highlights of this year’s Comic Con was the Gotham City themed zipline. Zipliners would exit the mobile zipline’s tower themed as a tall sky-scraper and soar over the city of Gotham. In celebration of FOX’s new television show, Gotham, the complete cast experienced the mobile zipline, Extreme Engineering’s Fly Wire™, ziplining at speeds of 21 MPH. 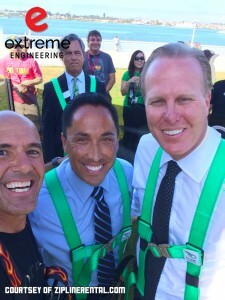 Carter Schmeck with Ziplinerental.com and the Mayor of San Diego take a selfie. Carter Schmeck, president of Ziplinerental.com and the owner of Extreme Enginering’s mobile zipline, operated at this year’s Comic Con. “We had a fantastic response and were told multiple times that our zipline was the main attraction at Comic Con. The cast of Gotham™ thoroughly enjoyed the zipline experience as well as thousands of participants throughout the week,” states Schmeck. Ziplinerental.com was hired by Van Wagner Experiential, a premier marketing and promotions company, for the Comic Con zipline event. Even the Mayor of San Diego paid tribute to the thrilling zipline experience. “This is one of the most exciting weeks of the year in San Diego. The zipline was great! I haven’t ridden one in years, especially in a suit,” states the Mayor of San Diego. The diorama of Gotham City and the Fly Wire themed as a sky scraper tells the story of Batman. 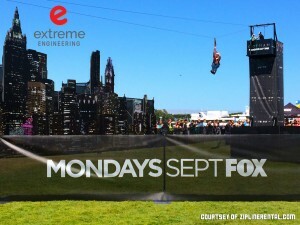 As the world’s largest supplier in patented mobile ziplines, portable ziplines, climbing walls, Extreme Air Jumpers and adventure products for the amusement and resort industries, Extreme Engineering manufactures award winning products such as the Fly Wire™ Zipline for entertainment enthusiasts on an international level. Extreme Engineering’s thrilling Fly Wire™ mobile zipline recently won one of the most prestigious industry awards in the “Best New Product” category for “Best Major Theme Park Ride,” earning their 8th total industry award. The award winning Fly Wire™ mobile zipline provides thrill seekers the ultimate rush of zip-lining across the sky up to 300 feet – the length of a football field. With speeds reaching up to 21 MPH, the Fly Wire™ is the only mobile zipline of its kind using the safest decelerator on the market, the Decelinator™, which is a proprietary device that fully lowers zip-liners safely to the ground so riders can soar through the air with confidence. Offering unparalleled “quick cycle times” to serve up to 90 riders an hour, there is no other portable zipline product in the world that can compete with the Fly Wire’s™ completely controlled method of keeping zip-liners safely off the ground. The Fly Wire™ mobile zipline and stationary zipline can also currently be experienced at Westgate Resorts throughout the United States, Exploria’s Summer Bay in Orlando, Florida and Raw Hide Western Town in Phoenix, Arizona. You can also rent the Fly Wire™ zipline from Carter Schmeck with Ziplinerental.com.